At the 1901 Arts Club in London, actress and singer Sarah Gabriel and director Richard Williams, accompanied by Iain Farrington on piano, chat about their show, Dorothy Parker Takes a Trip, shortly before the show’s performance at the Oxford Playhouse in May this year as part of the Ashmolean’s American Cool Festival. Originally commissioned by the Dartington Festival, the show explores the life of poet and writer Dorothy Parker. Famous for her caustic wit, Dorothy Parker is less well known for her support for the American civil rights movement. This was to be the source of a post-mortem feud with fellow writer, Lilian Hellman, who refused to collect Dorothy Parker’s ashes from the crematorium for years. With a nod to Noel Coward, Sarah and Richard reminisce about creating the show, the wildness and cultural ferment of New York in the roaring ’20s, and the perils of using stunt ashes…. With grateful thanks to the 1901 Arts Club for allowing us to use their performance space for recording this podcast, and to the Noel Coward Estate for kindly granting us permission to use excerpts from I Went to a Marvellous Party by Noel Coward, licensed courtesy of Warner/Chappell UK. 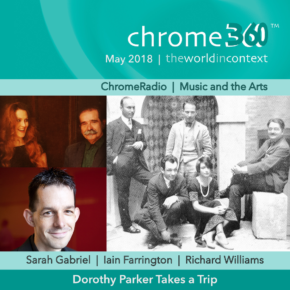 A ChromeRadio Production | Producer – Catriona Oliphant | Sound recordist – Chris Sharp | Post-production – Chris Sharp. This entry was posted on Monday, July 23rd, 2018 at 10:46 am and is filed under Chrome360, News, Our work, Podcast. You can follow any responses to this entry through the RSS 2.0 feed. You can leave a response, or trackback from your own site. Nobody has posted a comment yet, why not be the first?